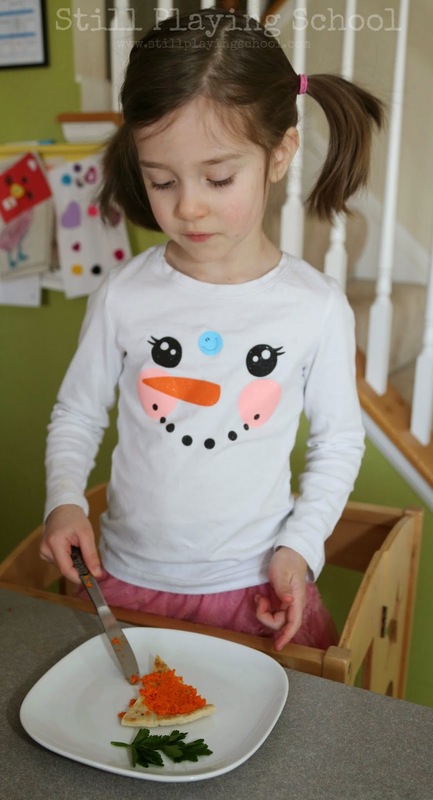 Our preschooler is becoming quite the pro in the kitchen with our Cooking with Kids series! 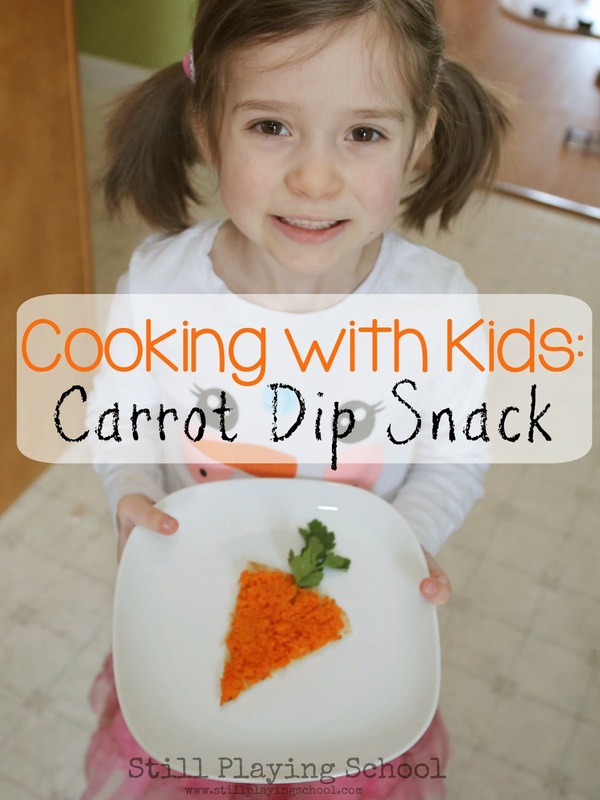 This week we made healthy Carrot Dip Snacks that look like real carrots just in time for Easter. Creating food that looks like something else is so much fun for everyone! We recently made Rainbow Pancakes so we've been inspired to be a bit artsy in the kitchen. We began by peeling and chopping about eight carrots. 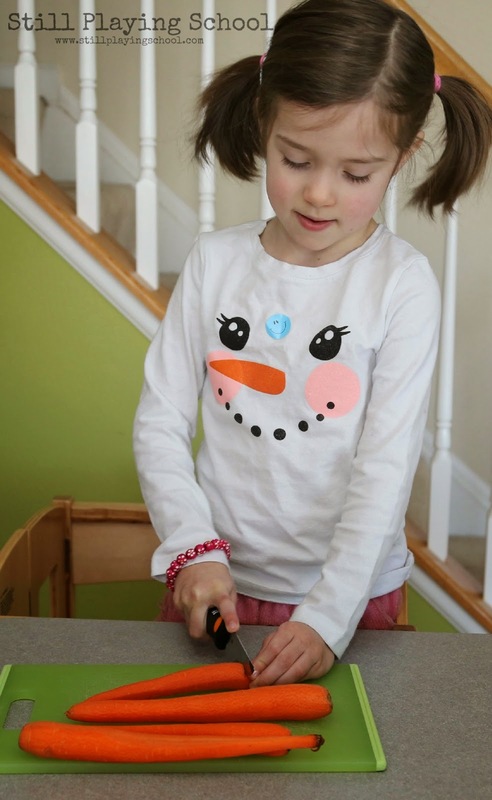 Our preschooler E helped using her KinderKitchen knife. You'll need two cups of carrots. 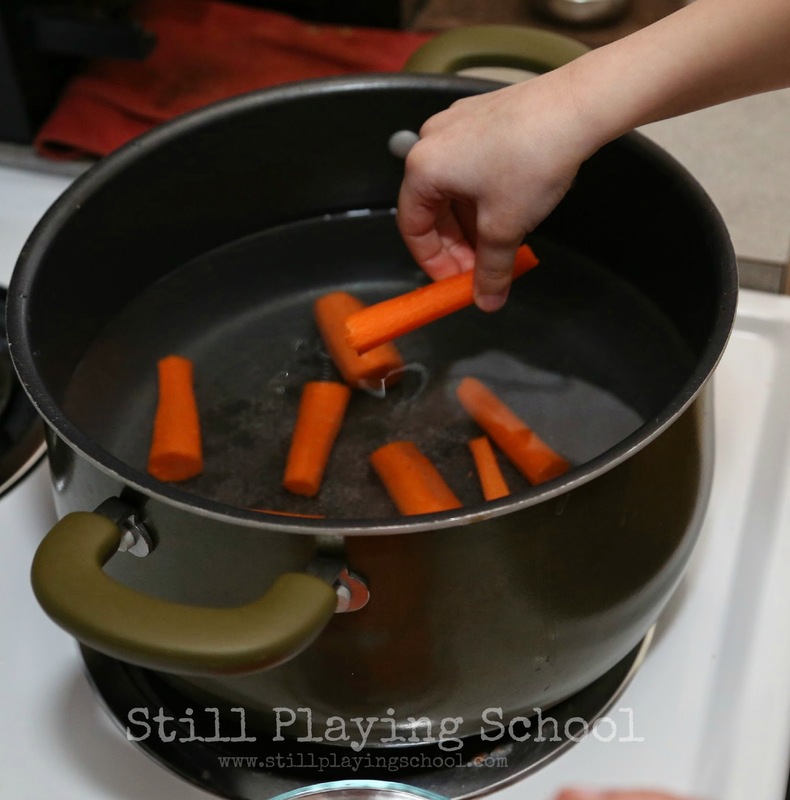 We simmered the carrots in a pot of salted boiling water until tender. E stood in her Kitchen Helper stool to carefully add these to the hot water. She loves the responsibility of helping at the stove with careful supervision and safety. 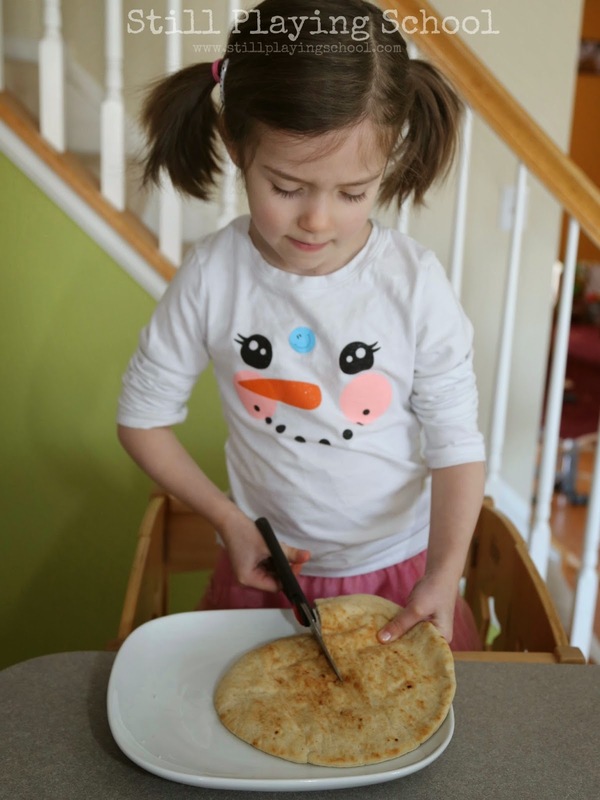 While the carrots were cooking we cut round pita bread with kitchen shears. Again, our daughter was carefully supervised and talked through this process but you know your child best. Use caution and your judgement when assigning kitchen tasks to children. We had a math lesson during this part of the recipe. E cut the pita in halves and then fourths (or quarters) and then eighths. We reviewed equal parts of a whole, fractions, and math terms as we worked. When the carrots were tender enough to be easily pierced with a fork we drained them into a colander. 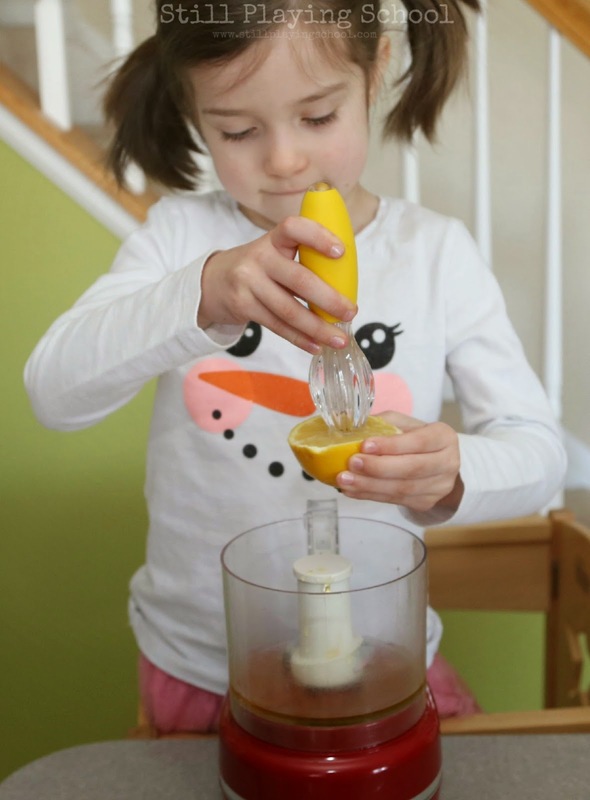 We put a tablespoon of honey, a tablespoon of olive oil, a teaspoon of minced garlic, and the juice of half of a lemon into our food processor. You could experiment with other spices such as cinnamon, cumin, and paprika! We put the carrots in the food processor and pulsed until we had a spreadable dip. 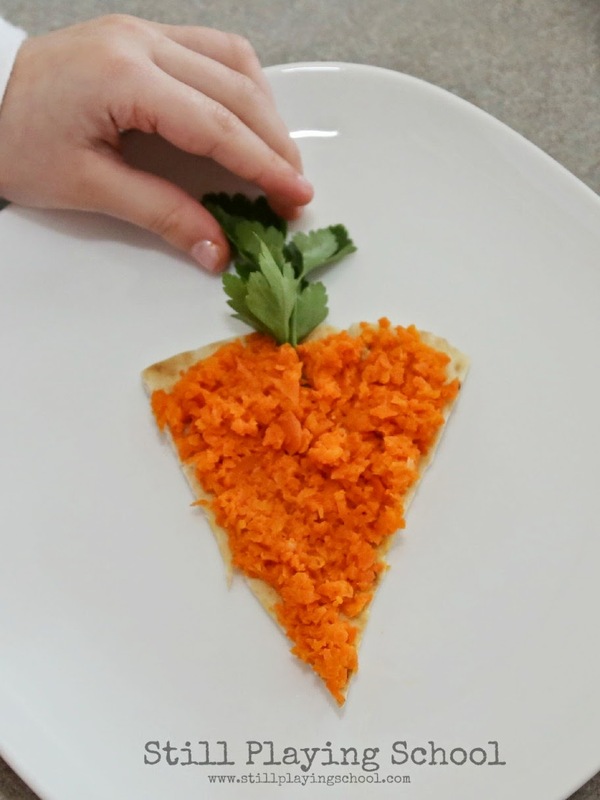 E loved spreading the dip on the pita to create carrots. We garnished with parsley. She loves recording "cooking show" videos so I'll allow her to tell you about this step of the recipe. Aren't these just adorable for Easter appetizers or a fun Spring lunch? She wasn't a big fan of the garlic in our recipe but I loved the dip! You can serve with crackers, chips. or pita toasted or plain. 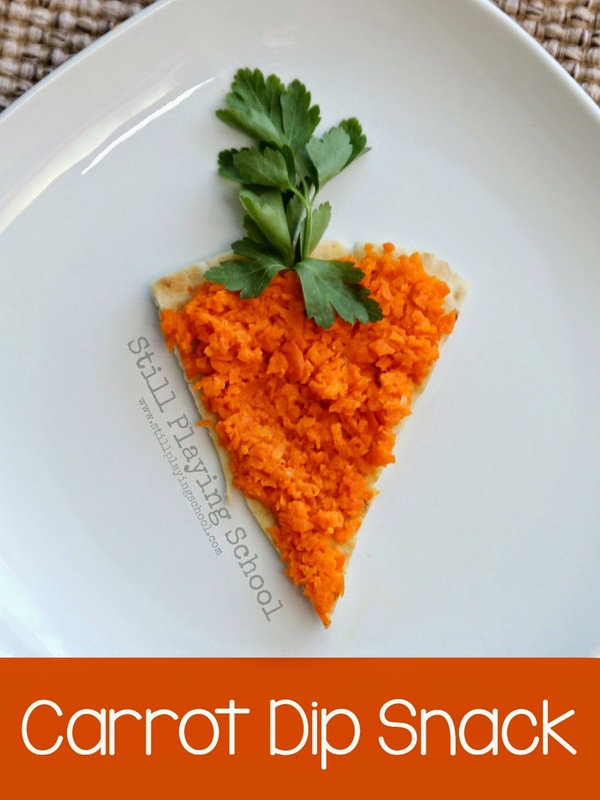 This is so cute - I am going to make it with the kids this week for an after school snack.